I found this saying stamp at the very first stamp convention I ever attended, I took a picture of it and have been searching for it ever since...yeah I know should of bought it there! Well I went to another stamp convention in mid October with a bunch of my online friends and it was there so I scooped it right up (stamp from Stamp La Jolla) and made this card for a friends birthday. I had this adorable scraps of star paper in brown and paired it with some pink background paper and then I found this cute striped brown paper too and thought it looked pretty cute. 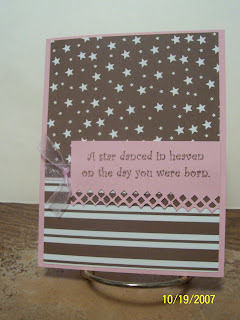 I stamped the saying on pink paper with my TAC Palette Ink and then used my border punch to add the decorative bottom edge. Used a scrap of pink sheer ribbon and tied the knot to the side. Hope you enjoy it too!